Kgahliso Mangoale joined Sonke as Sub-Awards Specialist. She is responsible for managing the sub-award process with a focus on reducing risks to Sonke and assess the partner’s ability to implement the project, manage the funds and work with the project manager to monitor sub-recipients and assist with capacity building. She hails from the Limpopo province but spent a significant amount of time in Pretoria and Johannesburg where she completed her tertiary education and early years of work. 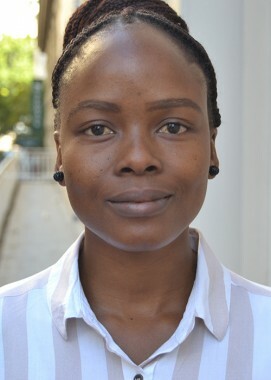 She obtained a Bachelor of Social Work from the University of Pretoria, a multi-faceted qualification that consisted of modules ranging from psychology, sociology, culture studies, social work, entrepreneurship, social policy development, research to project management as well as practicum exposure of each module in different workplaces. Kgahliso’s experience ranges from fulfilling roles of a social worker, sub-award project coordinator, project manager and community developer, in the fields of substance abuse, working with children living with a mental disability, working with inmates in correctional centres as well as community systems strengthening providing psychosocial support, technical assistance, donor support and management, project coordination management. She is passionate about social science programming, community systems strengthening, individuals’ upliftment and social entrepreneurship. Having worked in a dynamic civil society organisation she’s gained various skills in social programming, such as training, sub-award management, data management, research and documentation to name a few.